Thinking about getting a new bike helmet this season? Good idea! 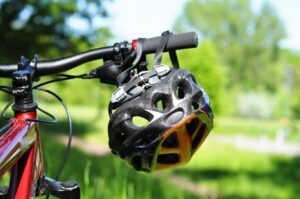 Bike helmets should generally be replaced about every five years, and they should always be replaced as soon as they’re involved in an accident. There are many helmets to choose from these days, though, so you might be wondering which one is right for you. Today we’ll look at a few helpful tips that can make the helmet-buying process a little easier. Some bike helmets are designed for road bikes, while others are designed for mountain biking or BMX. The differences between these helmets aren’t just aesthetic; they’re designed to protect riders in very specific scenarios as well. If you’re riding on the road, look for a compatible helmet to match. You should steer clear of helmets made for other sports such a skateboarding and kayaking as well. Good-quality helmets typically come in different sizes to accommodate people with heads of all shapes and sizes. To find a helmet that fits you properly, you can measure the circumference of your head with a flexible tape measure. Just wrap it around the widest part of your head—about 1 inch above your eyebrows—and record the measurement so you’ll be able to select a helmet with a good snug fit. You should always try a helmet on to make sure it fits properly before you commit to buying. Keep in mind that the helmet should be worn horizontally on your head, not tilted back or forward. The chin strap should also form a comfortable “V’ shape that goes behind and in front of each year. It should also fit securely without being too tight. If you think the chin strap might be too tight, check to make sure you can slide your index finger between the strap and your chin. Need a hand finding your new bicycle helmet? Stop by Nantucket Bike Shop today and we’ll be happy to help you choose a great helmet for your unique needs. ← Why Did Penny-Farthings Have One Big Wheel?